have i told you how funny my girls are? >Happy Birthday!!! Have a great one and enjoy those kids before they’re all grown up! >Happy birthday! LOL, that cake is hillarious! >Happy Birthday! You are so funny, I bet your house is a riot too! Have a great day! >CUTE!!! You’re not old… nowhere near it, despite what the kids say.For me, when I reached 30, I just started celebrating anniversaries of my 29th birthday. Sounds better that way. 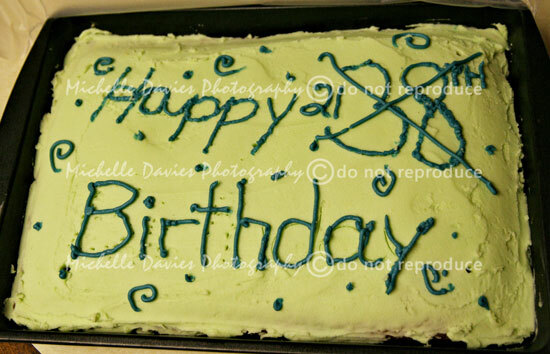 :)Happy 38th… er, I mean 21st, Birthday! >HAPPY 21ST BIRTHDAY (again…) hehe!! I’m 39 and holding…. for the last 2.5 yrs! )Hope your day was great!